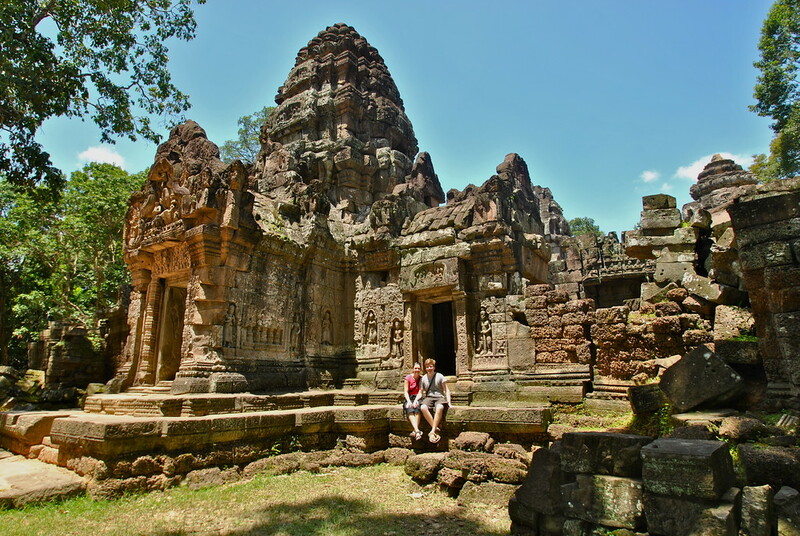 Where is Angkor Wat & How To Visit It! The pinnacle of the great civilisation of the Khmers, Angkor Wat is a beacon of achievement in a region fraught with conflict. 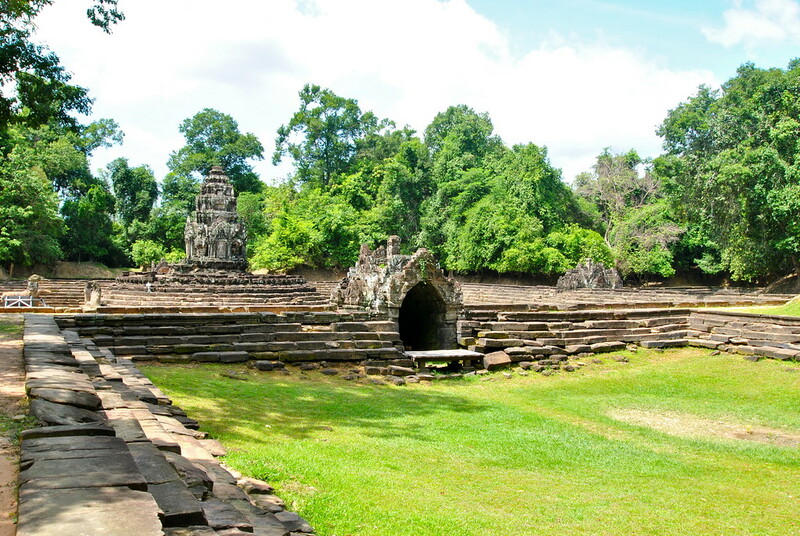 The Angkor Archaeological Park is the largest Hindu temple complex in the world, with the main set of temples spread out 11 kilometres North to South and 15 kilometres West to East. 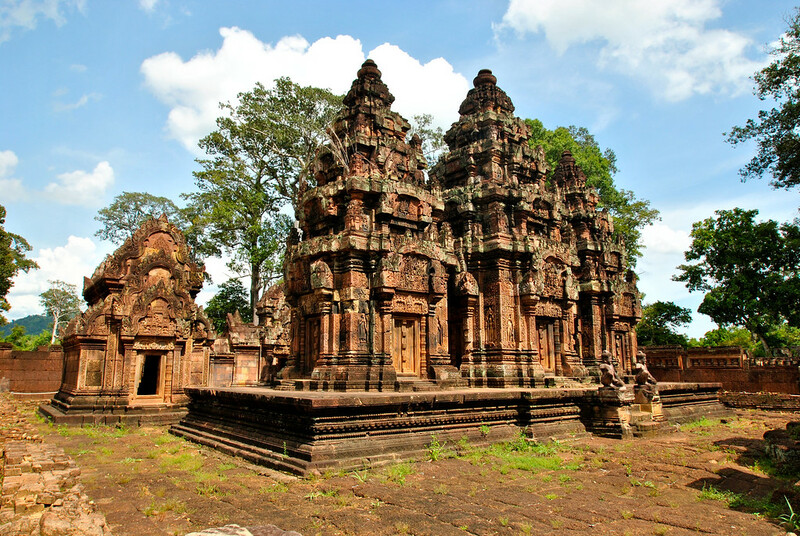 Other temples sit further afield, Banteay Srei a further 20 kilometres form the main set of temples. 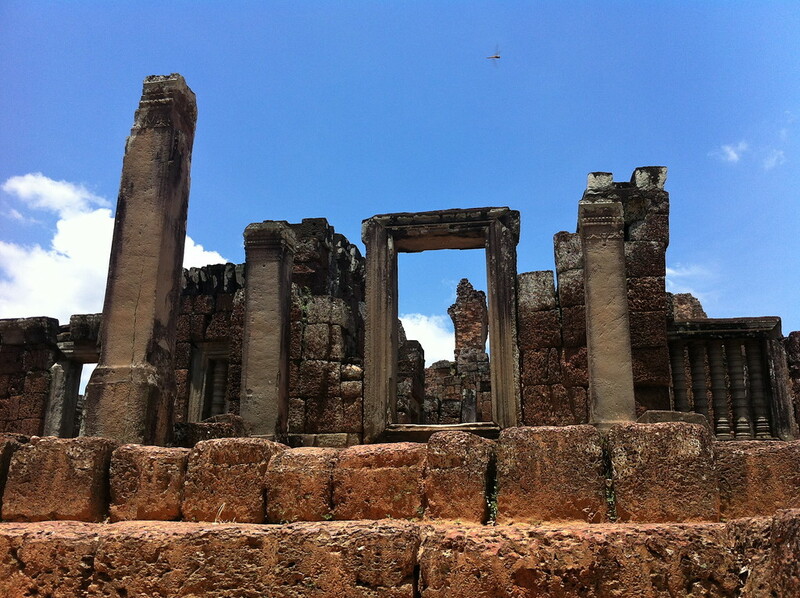 There was a lot to see, so we set aside two days to explore these ancient ruins. A mere 5.5 kilometres from Siem Reap, the city is a perfect launchpad to explore the remnants of the Khmer empire. We decided to hire a tuk tuk for two days, shunning the self propelled bicycle option due to the incessant heat and the desire for us to complete Angkor in two days instead of the recommended three. Up at 0630, we were picked up in our tuk tuk and began the 20 minute journey out of Siem reap to the complex of Angkor. After passing through a checkpoint, our driver Mr Lim began the tour of the complex. As we motored along the road in our open tuk tuk, we got our first glimpse of the main event in Cambodia, Angkor Wat itself. Its towering lotus flower shaped towers guarded behind a 3.6 km long moat and ancient wall. We were desperate to visit it, but we were recommended to save the best until last! First up was the largely unrestored Preah Khan. This was a great introduction to the temples of the complex, with towering trees and roots taking over ruined buildings of the Khmers. 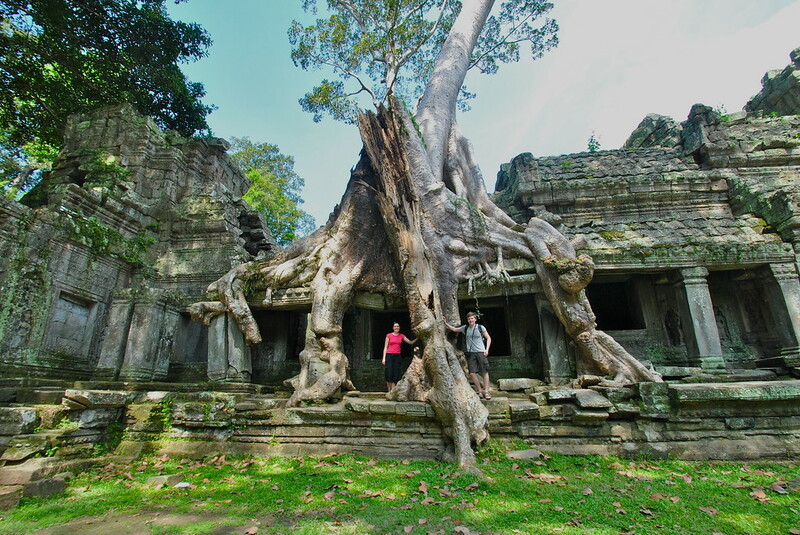 We spent about an hour at Preah Khan, wandering through the tree infested ruins and loved every minute of it. After Preah Khan, we were off to Neak Pean. 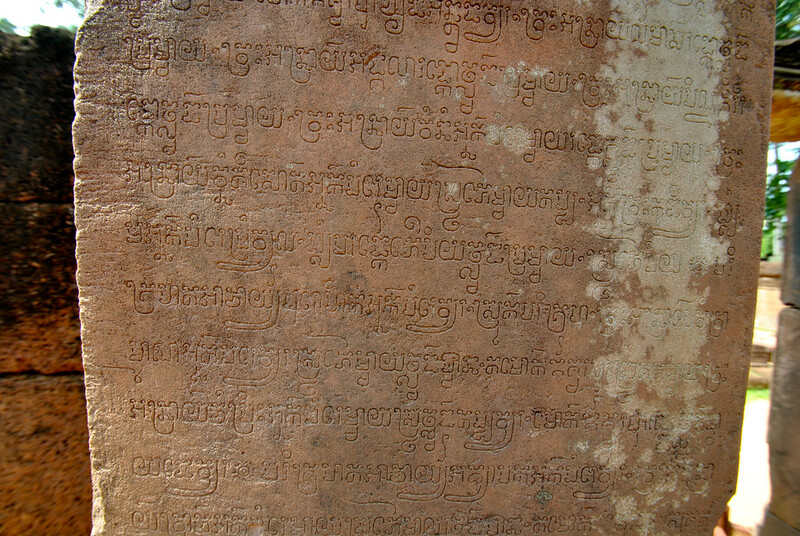 Once a hospital for the Khmers, the four connected pools representing Earth, Wind, Water and Fire were thought to cure all illnesses. Now dried out and in ruins, we only stayed a few minutes as there wasn’t much to see. Hopping back into our tuk tuk, we were off to Ta Som. We loved Ta Som temple, and more or less had the place to ourselves as we wandered around that morning. After a quick stop for lunch, we hit the road for the long drive to Banteay Srei, 20 km north of the main temples. 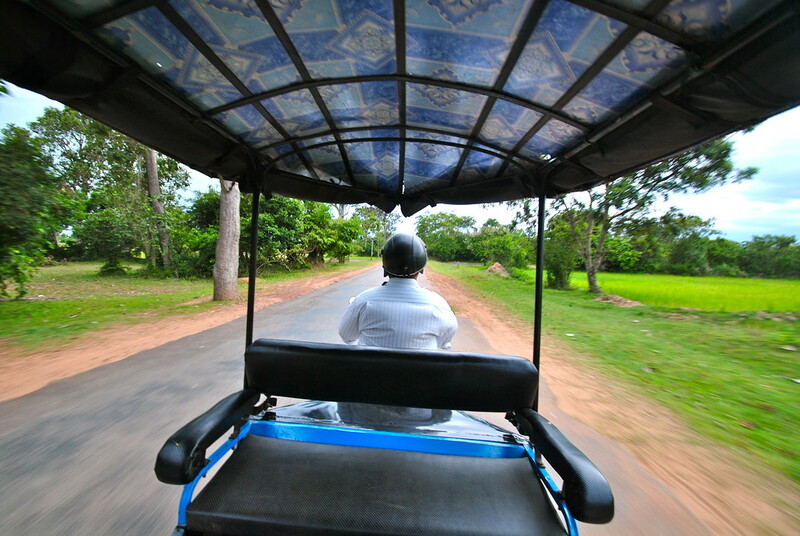 We say a long drive, but try spending 45 minutes in a tuk tuk along bumpy roads! It was worth it though. 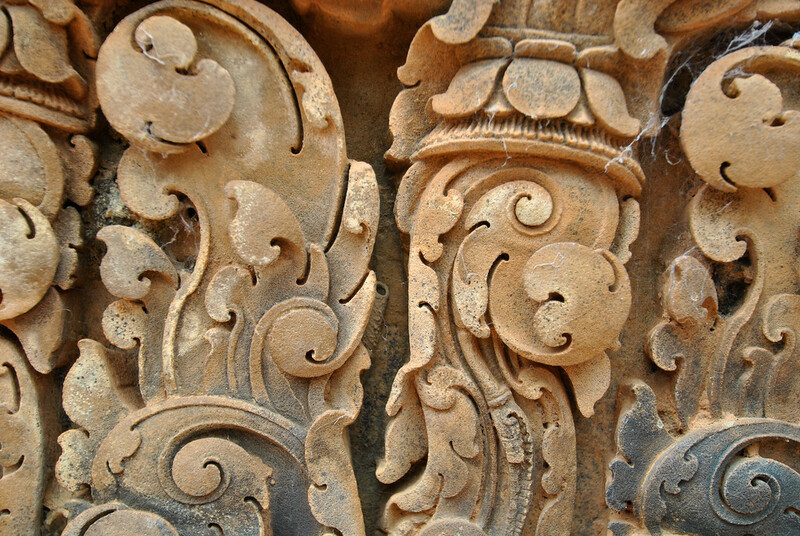 Many of the carvings in stone were incredibly delicate and intricate. Our final stop of the day was the beautiful Pre Rup temple, where it is believed funerals were carried out. This was one of our favourite temples of the trip, even if the sun was searing down on us at this point! And so our first day at the Angkor Wat complex was complete. For those thinking of visiting Angkor Wat, we would highly recommend it! After day 1 we were exhausted, but in awe of all that was achieved by the Khmer empire, and the level of preservation of some of the buildings despite natures best attempts. Our second day at Angkor Wat was equally as spectacular! Cheers for the help with an itinerary! I cant wait to go here next year! Can I ask how you arranged your mini tour and what it cost? Looking forward to reading about Day 2. No problem Neil! We just booked the tour through our guesthouse, all of them offer it! Think we paid US $15 for the first day, and US $20 for the sunrise day…well worth it in our opinion! Hi Ann! We stayed at Sam So guesthouse which was a little out of the centre but walkable. 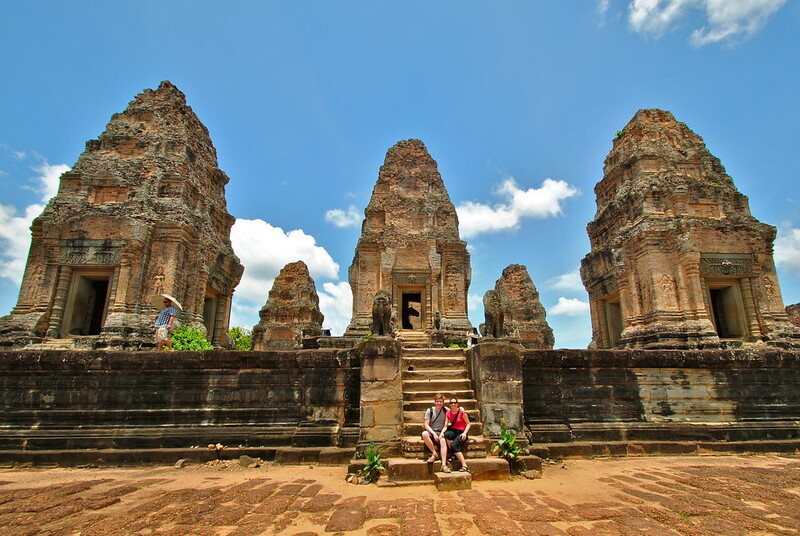 There is so much choice in Siem Reap compared to the rest of Cambodia! Have a great time! Your pictures are just amazing. I’ve been to Angkor once. 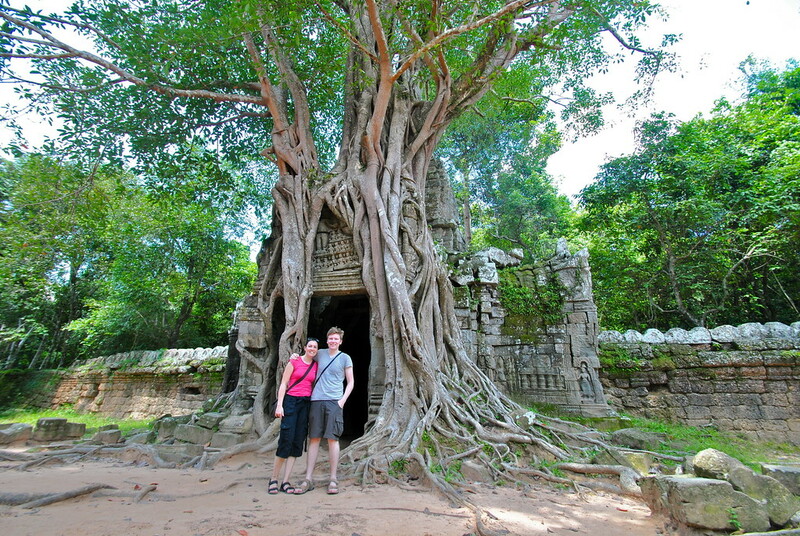 My favorite temples are Angkor Wat, Pre Rup, Banteay Srey and Ta Prohm. Thank you Andrew! It’s mind boggling how big the complex is, we’d love to return one day and take it a bit slower and see some of the other temples further out!